Now the vigil begins. Like sitting bedside with a loved one, we are all going to be bedside while we see if the David and Gladys Wright House “recovers” from the imminent illness of certain demolition, or if we see it slip away like so many other significant homes and buildings in our City. When we love someone and they are infirm, the gift we give is to be there to mop a fevered brow… to deliver a bowl of soup… to share with others the life story of the good time we shared together. If that person recovers, we can celebrate even more the cherished times, the future memories and the temporary fragile nature of all things. It’s time to remind ourselves once again of what we are in the very process of potentially losing. 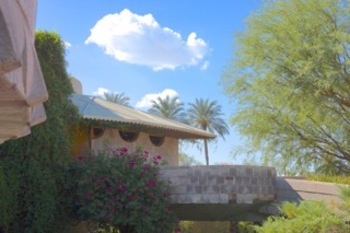 The David and Gladys Wright Home, perhaps one of the most significant homes designed by Frank Lloyd Wright, IS part of the collective family of design that we commonly share together as residents of the Valley. A family member so to speak. This cultural landmark is still highly endangered and the future outcome of it’s imperiled existence is far, far from settled. Every effort that we could make to bring a buyer to this home has been made and is still ongoing, yet we’ve been informed that in days, even hours, access to the home for the opportunity to bring a new buyer will be terminated. If this home does not get sold in it’s entirety, it is then on the current Owner/Developers to adopt a strategy of subdivision that must remain sensitive to the design of the home. Even though many serious, passionate and competent people have come together to present such a scenario to the Owners, their consideration of such a plan has not been committed to on their part. Worse, it could all slip away. Like a thief in the night we could awake to the day that this home is gone. A documented memory. An entry in our family scrapbook. Another ” this is where it used to be” comment to a younger person who will have no idea what we are talking about, and maybe no idea why we even chose this place to call home, because now, it looks just like anywhere else. The Owner/Developer/Builder is passionate about building “Quality” homes in Arcadia. A respectful calling. But at what point does “Arcadia” cease to exist of any recollection of what came before, the structures, the trees, the irrigation, the very human scale of living, is erased. The Architectural “Quality” of this home is unequaled. The setting a great anchor to the look and feel of “Arcadia”. Some things must stand to remind us of what we liked about the place. Love is why we help ours and others. Respect is why we celebrate and save buildings. Let’s sit watch on this imperiled home, take actions by attending to and administering cures in a healthy manner. Support and spread the word about this home and the steps we can take to support. Make certain the City, the Press, the Community all know that it means something to you; the Citizen, the Voter, the Taxpayer. YOUR voice is equal to each and every other in this State. Soothing words for the sick. Don’t let this house, our family member, die alone. Sit vigil. Drive by and take a long look. With your voice and support, we can make sure it’s not our last look. Be part of the cure!